Two women have been shot dead at a house in East Sussex, police have said. 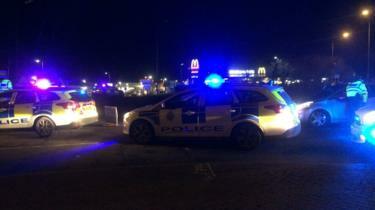 Armed officers responded to reports of a shooting in Bexhill Road, St Leonards, at 19:43 GMT on Friday. Sussex Police said two women, aged 32 and 53, had been shot dead, while two more - one pregnant - were led to safety from the house by firearms officers. They were both uninjured. Two hours later, a 35-year-old man was arrested on suspicion of murder and a firearm was seized. Det Ch Supt Jason Tingley said: "Tragically two women aged 32 and 53 have died after being shot and our thoughts are with their family and friends. Police said the women were known to the arrested man. The shooting prompted a large police response, with witnesses reporting a number of police vehicles and the force helicopter in the area. The road was closed and police advised the public to stay indoors.